Michelle Obama's Balenciaga boots are glittery and amazing. 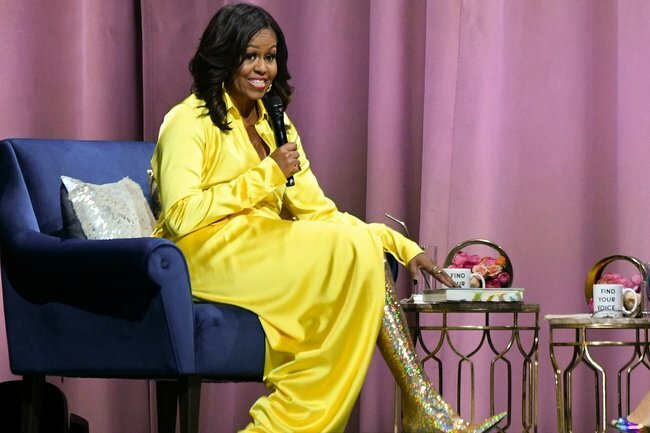 Michelle Obama just wore thigh-high glitter boots and we're OBSESSED. There’s no denying that Michelle Obama has cemented her position as First Lady of Style. Over the eight years of Barack Obama’s presidency, the 54-year-old became well known for her sophisticated style as she graced not one but three covers of US Vogue. And now, nearly two years on since her husband’s time in the White House ended, the former First Lady’s sense of style has certainly become more daring and, erm, glittery. 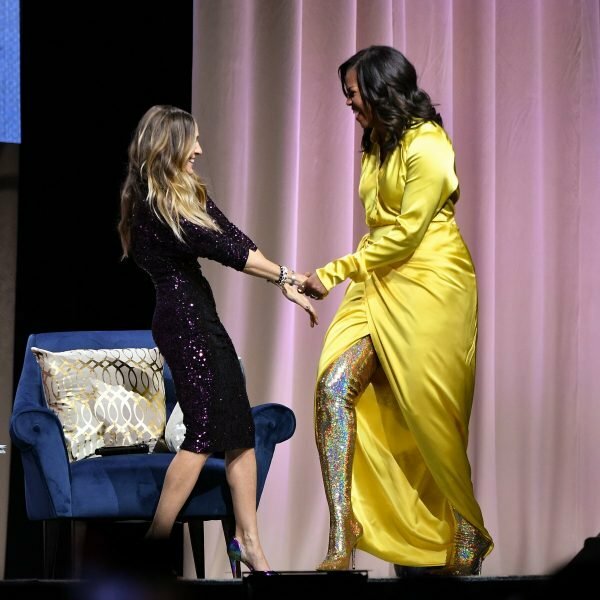 Appearing in New York City to promote her bestselling memoir Becoming overnight, Obama wore a pair of incredibly glittery, thigh-high Balenciaga stiletto boots. And to make matters even more incredible, Obama appeared at the event alongside moderator Sarah Jessica Parker. We&apos;re pretty sure Carrie Bradshaw would approve. Image: Getty. 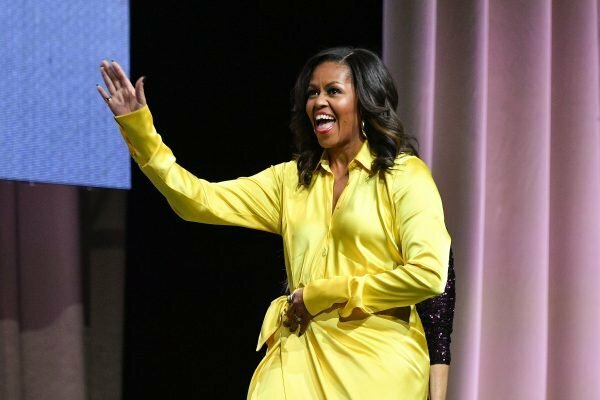 Pairing the AUD$5,485 boots with a Balenciaga yellow wrap dress, the former First Lady&apos;s look proved popular with Twitter users. Apologies in advance to everyone who is going to have to listen to me go on about Michelle Obama’s boots for the rest of my life. 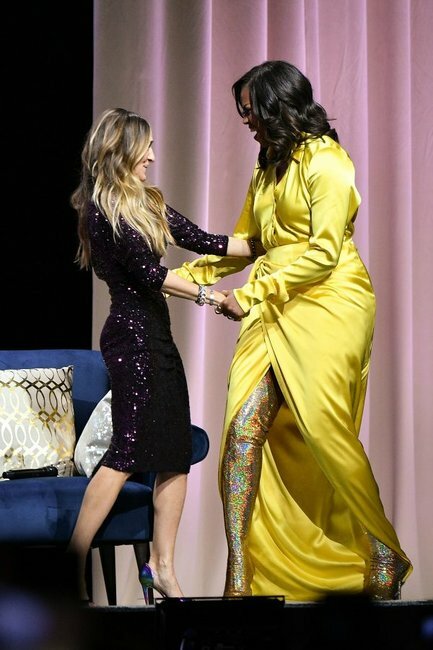 I did not know I needed to see Michelle Obama in knee high gold lamé boots, but apparently I did. Speaking at the event, Obama shared the importance of the clothes she chose to wear during her time in the White House. "I did know that my clothes were making a statement, I knew that was the case," she said. "So we decided why don&apos;t we use this platform to uplift some young new designers who normally wouldn&apos;t get this kind of attention, because you can change their lives, which is one of the reasons why we chose Jason Wu for my inaugural gown," she continued. During her time in Washington, Obama often wore high-street brands, like Gap and Target, alongside clothes from up-and-coming or independent designers. 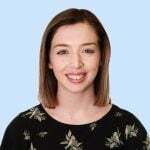 "I didn&apos;t want to wear the clothes of someone who didn&apos;t have a good spirit, and you could hear these things, you could hear how they treated my staff or how they treated their work, so everyone I wore as far as I knew had a good spirit as well." Explaining her decision to wear her glittering boots, Obama told Parker: "Now, I&apos;m free to do whatever." "They were just really cute," she said. "I was like, &apos;Those some nice boots!&apos;"
If you happen to have a spare $5000 lying around, you can purchase Obama&apos;s iconic boots right here.